With apologies to Fresh Ink Theatre Company. The Queen Geek was waylaid by illness and could not complete her review until now. (Boston) Handicapping by James McLindon combines three heavy subjects into one script: gambling addiction, physical incapability, and the deep holes we dig ourselves when we deny reality. It is a short but effective play. From the moment the lights come up, with the help of the Fresh Ink crew, McLindon’s script relentlessly reveals the exacting scarcity that is his cast and plot. There is no hope for the denizens of the betting booth. There is hope for the audience. There are two common definitions of the term “handicap.” In horse racing, a handicap is a weight added to a horse to equalize the chances of all competing horses in a race. Handicapping is the monetary gamble towards the horse with the worst odds. Thoroughbred Handicapping is the sport of predicting which horse will win a race. Per Villanova University, a handicap is also defined as a “physical or attitudinal constraint that is imposed upon a person, regardless of whether that person has a disability.” A set of stairs would be a handicap for a person with a disability who uses a wheelchair. The first definition is explained immediately by the setting of the play: the betting booths in an economically destitute area of Northern NY. Ant (Kyle Blanchette) is gambling away his impressive business capital to buy a pizzeria. He hangs around with the high-strung Prof. Dunne (Laurie Singletary) and booth employee Angie (Jaclyn Johnson) while watching the races. They bet on horses with terrible odds and compare strategies. It would be easy to assume that McLindon reveals the second definition by introducing Vin (Alexander Roy), Ant’s wheelchair bound friend. I’m glad that McLindon decided against it. Rather, Ant is handicapped by the summation of his interpersonal relationships. Singletary is electric as Prof. Dunne. She speaks about math and strategy the way fundamentalists discuss God. It isn’t until the big reveal in Act 2 that the audience fully understands how powerful Singletary’s performance is throughout. Alexander Roy deserves major kudos for his portrayal as Vin. Not because Roy is in a wheelchair. Not because Roy played his character with dignity. No, he deserves appreciation for his role because he played Vin as a person. Vin is an immature, deeply selfish jackass still living his high school days. He is also in a wheelchair. It is intensely satisfying to see a member of the disabled community portrayed as just a person. We are often relegated to the status of a problem to be solved or the Deus Ex Machina: the magical broken person who fixes things. In Handicapping. Vin is delightfully cretinous like so many people with or without a disability. Because people with disabilities are still people and people can be, on occasion, terrible. Bravo, Roy and McLindon! And thank you. That being said, not everything worked in this production. As previously stated, this is a show devoid of hope so the majority of the play has no momentum. The first act is used to explain Handicapping’s reality more than it is to show us the reality. Almost all of the character development is saved for Act 2. There are some kinks to work out but the meat of the play is healthy and good. Aside from bigotry issues, there is no reason why Handicapping shouldn’t be enjoyed by all. If you enjoyed this article, please consider making a donation. Every cent earned goes towards the upkeep and continuation of the New England Theatre Geek. 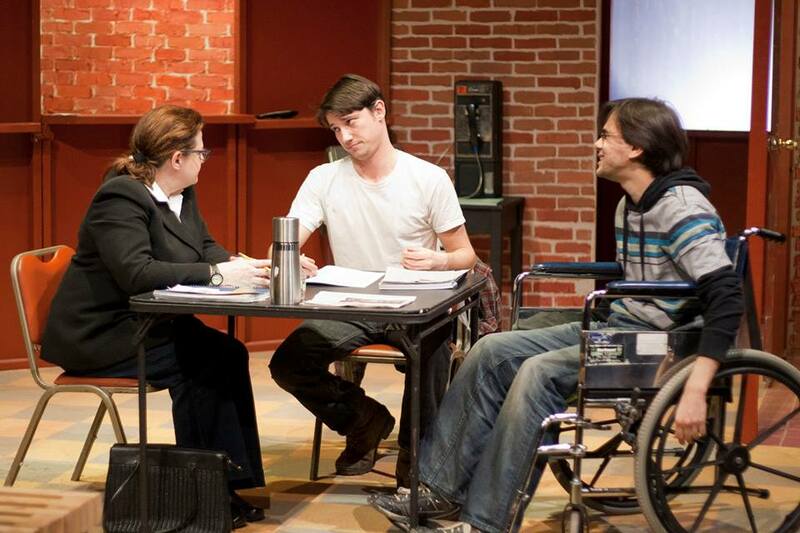 This entry was posted in Drama and tagged "Handicapping", 2014, Alexander Roy, Boston, disability, February, Fresh Ink Theatre, handicap, Jaclyn Johnson, James McLindon, January, Kyle Blanchette, Laurie Singletary, MA, The Factory Theater, Tyler Monroe, Vilanova Universty by Kitty Drexel. Bookmark the permalink.